(SAVANNAH, GA) Help Pack the Park for Park Place Outreach – Youth Emergency Shelter on Tuesday, August 6th at 7:05p.m. Come cheer for the Sand Gnats as they take on the Charleston Riverdogs and help support Park Place Outreach. This mission of Park Place Outreach Youth Emergency Shelter is to provide services to at-risk youth and their families, increase their functional level, and reunify families whenever possible. (SAVANNAH, GA) The Small Business Administration and Small Business Majority are launching the Affordable Care Act 101 weekly webinar series. Thursday, August 1, at 2 pm ET: Click to register https://cc.readytalk.com/cc/s/registrations/new?cid=p4kn4esrz8en. (SAVANNAH, GA) Savannah AMBUCS raise $5,125 at 2nd Annual BOWLAPALOOZA Kick Off at Coach’s Corner on Monday July 22nd. For more information see savannahambucs.com. (SAVANNAH, GA) Friends of Animals of the Coastal Empire, Inc. (FOA) announces its 15th annual auction, "Hawaii Fid-O," on Saturday, August 24, at Savannah Station, 601 Cohen St., 7 – 11 pm, $45/person includes food, auction, raffles, and bar. Come dressed in Hawaiian attire. Proceeds will benefit: Bryan Animal Caregivers, Paws of Effingham, F.A.C.T.S, Islands Feral Cat Project, Save-A-Life Animal Welfare, Second Chance Animal Rescue, and the Humane Society of Greater Savannah. Tickets at friendsofanimalscoastalga.org. Like them on Facebook or contact Chris Comas at 912-661-1758. (SAVANNAH, GA) Savannah AMBUCS President Kevin Sheehan will be speaking at West Chatham Rotary on Wednesday July 31st at 12pm at Savannah Quarters clubhouse. (AUGUSTA,GA) – Linden Square Senior Apartment recently celebrated their 10th Anniversary. Mayor Copenhaver joined the residents in the celebration and proclaimed June 27th as Linden Square Senior Apartment Community Day in Augusta. Also attending the celebration were Commissioners Corey Johnson, William Fennoy and Marion Williams. The 48 unit, gated apartment community, developed by 30901 Development Corporation, is located at 1425 Lee Beard Way. (AUGUSTA, GA) The Augusta Chronicle features a news article on the most recent community meeting for Laney Walker/Bethlehem. The article focuses on the challenges of developing one of the project’s key priority development areas, Foundry Place. (AUGUSTA, GA) The projected impacts of Georgia Regents University on Augusta over the next 17 years are highlighted in a video located on the Augusta Tomorrow website. (AUGUSTA, GA) The Augusta Photography Festival, Inc. presents "Reframing the Subject: Photographing Transformation in Laney Walker/Bethlehem" September 27-29, 2013. This weekend-long workshop features classes and photo field trips focused on Augusta’s historic Laney Walker and Bethlehem neighborhoods. More information and registration at www.augustaphotofestival.org. (AUGUSTA, GA) Plans are underway for another great Blocks Are Beautiful celebration. Mark your calendar for Saturday, Sept 14 – details coming soon. Contact Edkesha Anderson at 706-821-1797 if you’d like to volunteer or have ideas to share. (AUGUSTA, GA) A special ribbon-cutting ceremony to officially open the Heritage Pine pocket park will take place on Tuesday, July 30th at 10 am. The ceremony will highlight the efforts of community leaders instrumental in launching the Laney Walker/Bethlehem revitalization effort. (AUGUSTA, GA) Royal Philips (NYSE: PHG, AEX: PHIA) and Georgia Regents Medical Center (GRMC), Georgia’s public academic health center renowned for its top-ranked doctors, announced a 15-year alliance to enable increasingly patient-centered approaches to care and to create an innovative business model that addresses current and future clinical, operational and equipment needs of GRMC’s multiple sites. The alliance is a first-of-its-kind delivery model in the United States. Through the agreement, worth approximately USD 300 million, the largest of its kind for Philips, the company will provide GRMC with a comprehensive range of consulting services, advanced medical technologies, and operational performance, planning and maintenance services with pre-determined monthly operational costs over a 15-year term. The alliance will broadly support the Georgia Regents Medical Center, Children’s Hospital of Georgia, Georgia Regents University Cancer Center and the health system’s numerous outpatient clinics. (AUGUSTA, GA) Not Gaddy, from IDrum2U, will be conducting a community drum circle event at the Morris Museum of Art on Saturday, July 27 at 2:00 pm. FREE and open to the public. (AUGUSTA, GA) Leaders from Paine College will be meeting with the core development team for Laney Walker/Bethlehem on Tuesday, July 23 at 3:00 pm to explore providing housing options for faculty and staff. (AUGUSTA, GA) Development activity in Laney Walker/Bethlehem is expanding, with work on phase two of Holley Street Commons and the start of phase one of a senior multifamily project in Twiggs Circle. Antioch Ministries, Inc. is the lead developer for Holley, while the Augusta Housing Authority is developing the 60-unit multifamily project. (SAVANNAH, GA) Local businessmen are invited to attend the second annual Christian Business Men’s Conference on Friday, August 23, 12:30-5:30 p.m. The event, which will be held at the Savannah Christian Education building at 50 Al Henderson Blvd., will focus on time management skills in the workplace. Joe Marchese of Marchese construction is the featured guest speaker. The conference is being held in conjunction with the third annual Pivot Rally, in which men from around the Southeast and several area pastors will gather at the Savannah Civic Center on August 23, 6-10 p.m. The Christian Business Men’s Conference was started last year by Dan Pavlin, founder of Alive in Savannah and an account executive at Bernard Williams Insurance and Financial Services, as a way for area men in the business world to obtain practical Christian business education and have the opportunity to network with other Christian businessmen. The event will focus on the best way for Christian businessmen to utilize their time and how to tune out distractions and stay focused on an Evangelical-driven life. The conference will include two main sessions and two breakout sessions led by 10 local business leaders. Tickets to the Christian Business Men’s Conference are free and include afternoon coffee and refreshments. At the conclusion of the conference, attendees are encouraged to join the 2,500 men gathering at the Civic Center for the Pivot Rally. Tickets to the rally may be purchased separately. The rally will feature speakers Cam Huxford, senior pastor at Savannah Christian Church; Kenny Grant, senior pastor at Calvary Baptist Temple; and Ricky Temple, senior pastor at Overcoming by Faith Ministries. The featured guest speaker is Steve Farrar, founder and chairman of Men’s Leadership Ministries. For more information on the Christian Business Men’s conference and the Pivot Rally, please visit www.pivotrally.org. To have your business featured at the Christian Business Men’s expo or to secure tickets, contact Dan Pavlin at dpavlin@bwcco.com or 912-604-3265. (AUGUSTA,GA) – Royal Philips (NYSE: PHG, AEX: PHIA) and Georgia Regents Medical Center (GRMC), Georgia’s public academic health center renowned for its top-ranked doctors, announced a 15-year alliance to enable increasingly patient-centered approaches to care and to create an innovative business model that addresses current and future clinical, operational and equipment needs of GRMC’s multiple sites. The alliance is a first-of-its-kind delivery model in the United States. Through the agreement, worth approximately USD 300 million, the largest of its kind for Philips, the company will provide GRMC with a comprehensive range of consulting services, advanced medical technologies, and operational performance, planning and maintenance services with pre-determined monthly operational costs over a 15-year term. The alliance will broadly support the Georgia Regents Medical Center, Children’s Hospital of Georgia, Georgia Regents University Cancer Center and the health system’s numerous outpatient clinics. (AUGUSTA, GA) Enjoy an acoustic performance from the guitarist and soulful singer-songwriter Chris Ndeti, Sunday, July 21, 2:00 p.m. at the Morris Museum of Art, FREE. (SAVANNAH, GA) Mingledorff’s, the Southeast’s largest independent HVAC wholesale distributor, held a golf tournament on May 24 with all proceeds benefitting Park Place Outreach – Youth Emergency Shelter. Rob Massey, Mingledorff’s Southeast general manager, and Brian Phillips, Mingledorff’s territory manager, presented a check for $3,120 to Linda Hilts, Park Place Outreach’s executive director on July 1. “Mingledorff’s very generous donation will help Park Place Outreach fulfill our mission of supporting youth who are in crisis,” Hilts said. The tournament, held at Southbridge golf course, is sponsored by Mingledorff’s as an annual customer appreciation event for the company’s Carrier and Bryant air conditioning equipment dealers. Mingledorff’s decided to turn this year’s tournament into a fundraiser benefitting a local charity. Mingledorff’s, founded in Savannah in 1939, is the Southeast’s largest independent wholesale distributor of HVAC equipment, parts and supplies. The company’s territory covers five Southeastern states, including Georgia, South Carolina, Alabama, Florida and Mississippi. Mingledorff’s is owned by the Mingledorff family, all of who reside in the Savannah area. About Park Place Outreach, Inc.
Park Place Outreach – Youth Emergency Shelter, located at 514 E. Henry St., provides support for troubled children and teens from Savannah and the surrounding area. The shelter is open 24 hours a day to youth in crisis, adolescents who are homeless, young people who have been abused, runaway youth, or those who may be contemplating how to run away. 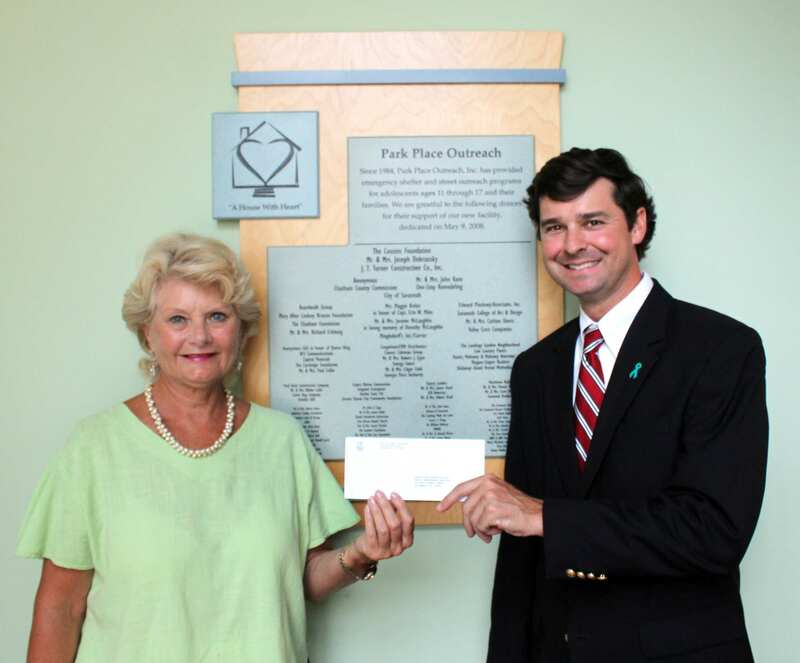 Opened in 1984 as Marshlands Foundation, Inc. (dba the Savannah Runaway Home), Park Place Outreach – Youth Emergency Shelter provides counseling and other services to boys and girls between the ages of 11 and 17. The organization’s goal is to keep kids off the street and reunify families whenever possible. (AUGUSTA, GA) Miss Adele Randall, one of the longest continuous residents in Laney Walker/Bethlehem, passed away Monday, July 1, 2013 at her residence at 1222 Pine Street. "In addition to being a remarkable individual," noted Housing Director Chester Wheeler, "Miss Randall provided our project with credibility, testament to the fact that we would not displace anyone who wanted to continue to be a part of this historic community. She will be missed by all of us." Funeral services will be conducted Tuesday, July 9, 2013 at 11:00 a.m. from W. H. Mays Mortuary Chapel with Reverend John Lockhart officiating. HOLLYWOOD, CA, Jul 01, 2013 (Marketwired via COMTEX) — Medient Studios, Inc. (otcqb:MDNT) (‘Medient’) today announced that the Effingham County Industrial Development Authority, at a meeting of the Property Committee of the Board on the 28th June 2013, formally approved the commencement of construction on the 1,550 acre property. Medient has initiated engineering, clearing and grading of the property, as part of a construction plan to have the studioplex operational by the first quarter of 2014. Medient Studios, Inc. (otcqb:MDNT) is an entertainment content creation company with a strong presence in North America, Europe and India. Medient’s management team has approximately 150 years of experience in the motion picture industry and is responsible for producing and/or financing over 250 movies. Medient is realigning the content creation process to enable efficiencies of scale and eliminate process waste by building a fully integrated movie and game production facility and campus on a 1550 acre property in Effingham County, Georgia. Once operational this production facility will be the largest of its kind in the United States. Safe Harbor Statement The Private Securities Litigation Reform Act of 1995 provides a “safe harbor” for forward-looking statements. Certain information included in this press release contains statements that are forward-looking, such as statements related to the future anticipated direction of the industry, plans for future expansion, various business development activities, planned or required capital expenditures, future funding sources, anticipated sales growth, and potential contracts. Such forward-looking information involves important risks and uncertainties that could significantly affect anticipated results in the future and, accordingly, such results may differ from those expressed in any forward-looking statements made by, or on behalf of, the company. These risks and uncertainties include, but are not limited to, those relating to development and expansion activities, dependence on existing management, financing activities, domestic and global economic conditions, and other risks and uncertainties described in the Company’s periodic filings with the Securities and Exchange Commission.